This is wonderful news Dr. Wallace, thank you every so much! The beginning of line 2 is difficult to see. Are we sure it is a gamma? It’s certainly not a a kappa, but could it be a tau? Terri, I think you may be right. I made that decision in haste, as I am looking through hundreds of pages of MSS every day and writing up quickly what I’m finding. Thanks! This is of course just conjecture, and dittography may be more likely, but what if the nonsense reading “εν τη ογδοη τη ημερα” were really based on a earlier manuscript somewhere down the line that read “εν τη ημερα τη ογδοη” (i.e., “in the day the eighth”)? For the life of me, I can rarely remember what the technical name for that construction is called [article+noun+article+adjective modifying the noun] (some kind of attributive? ), but at least it would not be a nonsense reading. 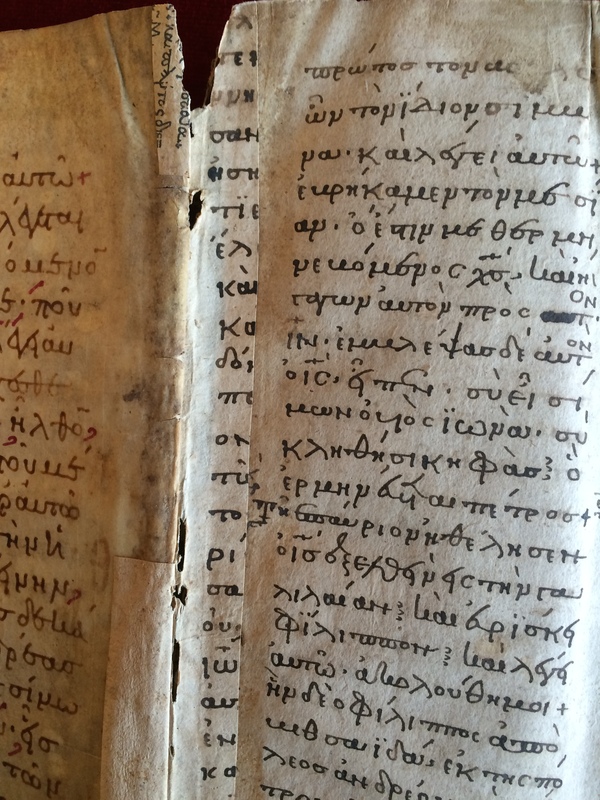 This does make me wonder how many (if any) known manuscripts have that reading “εν τη ημερα τη ογδοη” there in Luke 1. At any rate, keep up the good work, Dr. Wallace. We really enjoy reading your updates. Interesting possibility, Z. E. It’s called a second attributive position. Quite a few MSS have the reading εν τη ημερα τη ογδοη in Luke 1.59 (e.g., P4 א B C W 13 69 565 etc.). The problem is, that reading won’t work here. I suspect it is possible, however, that the scribe transposed the ημερα and ογδοη, thus creating the nonsense reading. 579* has εν τη ημερα ογδοη, which also is a nonsense reading. If there is such a transposition here, it would create a 15-letter line, in keeping with the line-size throughout the strip. I’m new to all of this, but very interested in the 200AD manuscripts found. Have they been published, any info greatly appreciated. I was told John MacArthur wrote a new bible with the findings of this manuscript in text. Please assist for any info. Melissa in San Diego. Melissa, I’m not sure what AD 200 MS you are referring to. Are you thinking about the Gospel of Mark fragment? I was wondering about the potential 1st century fragment of Mark myself. Any new news? This is so interesting. Wish I could add anything useful to your conundrum. May you discover many more new manuscripts! Keep up the good work, and thank you for keeping us in the loop. God bless you all there in Athens! Perhaps the first H is actually a OI? I wouldn’t base anything on the accent. And what follows some strange form of SUGGENEIS, perhaps SIGG…? Wieland, in light of the glob at the first vertical line on the eta, this is a distinct possibility. I think it deserves a vid! In that case, the possibility of σηγγενεις/ would mean that there was only one misspelling here, and one that would conform to medieval phonology. I have seen some medieval MSS that change the spelling toward the current phonology, even in titles! Thus, we get εβαγγελιον κατα Μαρκων instead of ευαγγελιον κατα Μαρκον (in a MS I examined a few weeks ago at the NLG). Thanks, Herman. We’ve “discovered” ten NT MSS so far; about half of these were already known to the library but none known to Münster. Probably a simple τεκ- for the second line is better than an unattested -γει-. Agreed. This was Terri Moore’s point earlier. It’s just a small strip of a medieval MS, Dominic. I wrote the blog to illustrate simply that some MS fragments, which have previously not been noted in any literature, can be analyzed and often identified. Strange, I know, but the omicron and omega are frequently interchanged. The spelling above is precisely that of 0211 in this place, and could easily correspond with the minuscule here. excellent observation, Jonathan! I think you may have solved the problem of these four lines! Friends, with the suggestions by Terri Moore, Z. E. Kendall, Wieland Willker, and Jonathan Borland, I believe that ALL of the identification problems have been solved! Thank you so much for your help. I am reminded by the dialogue that textual criticism nowadays must be done in community, and you all have demonstrated that well. The one question that remains is whether this is a lectionary or a minuscule. Although it was most certainly a two-column MS, we have far more two-column minuscules from this period than lectionaries. There are more strips in this MS that will need to be analyzed to make a final determination. Unfortunately, working 14-hour days on all of the NLG MSS, six days a week, doesn’t afford me the time for examining this MS further for some time. I believe that by the end of the year images of NLG 2711 will be posted at http://www.csntm.org, so others can then weigh in on this MS. Thank you all for letting me eavesdrop on this fascinating bit of your work. I had a brief unit on textual criticism as part of my NT Greek major almost 40 years ago, and although I understood the general principles, it wasn’t enough to do anything practical with. Textual criticism has always seemed very mysterious to me. This enlightening little investigation reinforces the great respect I have for the real-world work you do.